"The Ghosts of Mars" - Part One: "Extraterrestrial"
J'onn J'onzz communes with the sprit of his deceased brother with whom he had bonded to telepathically and reviews how his people died and the circumstances which brought him and Superman to the Earth. They discuss the recent hysteria regarding aliens and J'onn ponders the worth of revealing himself to the world. For one week J'onn follows Superman around and watches the crowd of onlookers as he fights a variety of super-villains. Superman finally "makes" him and J'onn tells Superman who he is and why he has been watching the Man of Steel. They become fast friends, though Luthor interrupts the conversation and hurls all kinds of accusations at the Martian. Superman defends his new friend, but is injured by one of Luthor's weapons. J'onn goes on the offensive, which is exactly what Luthor wanted as the villain broadcasts the encounter on television. The fight is eventually broken up but the peace is temporary as men dressed as aliens commit a robbery nearby. Superman and J'onn make short work of the crew and afterwards Superman flies J'onn to meet Green Lantern, Flash, Wonder Woman and Aquaman. 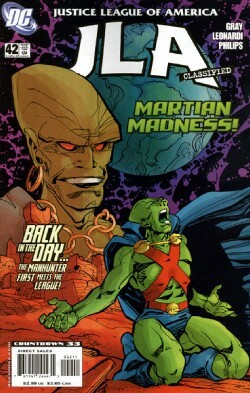 Story - 3: Here's the thing; I like the Martian Manhunter. Between Keith Giffen, J.M. Dematteis, Grant Morrison and John Ostrander I developed a strong affection for J'onn J'onzz. I realize this is all purely personal opinion based upon several writers' ability to convince me of the importance of J'onn's role in the DCU, but it is there just the same. In any case I feel that J'onn is not only a compelling character with a tragic back story, but also an important part of the Justice League. To me, because of the previous writers mentioned, he is and always will be the heart and soul of the team. Now I know that for some time, especially during the Satellite era, J'onn was largely absent from the League, but at the same time he was a founding member, he came back during the Detroit era to try and keep the League alive after Aquaman disbanded it, he stuck with it through the International years, served as mentor in JUSTICE LEAGUE TASK FORCE, was an integral part of the Morrison era and for the first two seasons of the animated JUSTICE LEAGUE he was an important part of the team. It was because of my affection of the Manhunter from Mars that I was looking forward to this particular arc. A story devoted mainly to J'onn that didn't have anything to do with that God awful mini-series from last year? Sign me up. I was a little nervous when I read that Justin Gray was writing the story. I am mainly familiar with his writing from the work he does with Jimmy Palmiotti and that has always been hit or miss with me. Liked UNCLE SAM AND THE FREEDOM FIGHTERS. Didn't like BATTLE FOR BLUDHAVEN. I was curious what a Manhunter story handled by Gray working alone would be like. So far I am not really happy with what I'm reading. Now all this should be taken as a knee jerk reaction to the first issue of a story arc and thus be considered suspect because I haven't read the whole thing, but I really don't like the way Gray is handling J'onn. The beginning was good. I liked the whole conversation between J'onn and his long dead brother. It served as a nice tool to bring new and old readers up to speed on who he is and what he is about. There were some nice character bits that would hopefully make the reader like the Martian Manhunter and maybe even relate to him just a bit. All of that was fine. The problem began when we got into the meat of the story and suddenly Gray's version of J'onn took on more subservient role in the history of the League. It was interesting to see him watching Superman from a distance and I can buy that J'onn would feel a connection with Superman due to their alien heritage. It fits into J'onn's personality as someone who observes a situation before jumping into it. Once he and Superman actually met, though, things started to turn a bit off, especially towards the end. I wasn't thrilled with the Luthor "saving humanity from the Martian threat" angle to begin with but the scene where Luthor tried to out both J'onn and Superman was forced and just didn't ring with me. This was a tired cliché where the bad guy tries to make the good guy look bad in front of the press. It makes sense on a certain level but has been done again and again and again to the point where I almost can't stand it anymore. So that was annoying. It was the last page, though, that got to me. Superman reveals that he used his x-ray vision to check J'onn out when he noticed the fact that he was being watched. He even apologized for it, which I thought was a nice touch. Then he introduces J'onn to the Green Lantern, Flash and the rest I guess to make him feel more welcome. To me, this takes J'onn down a peg or two in the food chain and does a disservice to him as a character. If you look at what has been done with the League's history over the past two decades J'onn was always a founding member. Now I don't know if Gray is trying to pull some retcon to take this away, but the impression the last page left me with sure pointed in that direction. Here's where I truly show my bias when it comes to this character. I have long liked the concept that J'onn showed up in the fifties and despite having a fling as a hero in the seventies with the Justice Experience didn't really "come out" until joining the League. For decades he simply did his part as a police or private detective and it was only during the new age of heroes that began with Superman revealing himself to the world did he feel comfortable acting in the open in something resembling his true form. Despite the hiding J'onn always struck me as an equal to any of the original members. If Gray has Superman introduce him to the heroes before the formation of the League then J'onn is relegated to the "little brother" position where he needs to hang around the big kids to feel more comfortable, which is demeaning to the character. If this story has the League already formed and this is how J'onn joined the League instead of being a founding member then it's even more insulting because it takes J'onn out of that role of being one of the "magnificent seven" and is, again, insulting to the character. But then again I could be completely off base and proven wrong in the following issue. I am completely open to the idea that Gray will pull things off next time and this story will take J'onn to bigger and better heights. I'm just not holding my breath. Art - 4: This is some of the best work I have seen from Rick Leonardi. With Sean Phillips getting co-credit the two produced a nice looking book that had some good action scenes as well as the quieter flashbacks. Everyone looked good and I really have no complaints about this aspect of the book. Cover Art - 4: Wow, that is one ugly woman. Seriously, it isn't a bad cover. It's not a great cover, but it's not all that bad either. It looks good so it gets a four.